Torquay naturalist Di Francis has won her biggest victory so far in her three year battle to prove the existence of a new species of big cat in Britain. 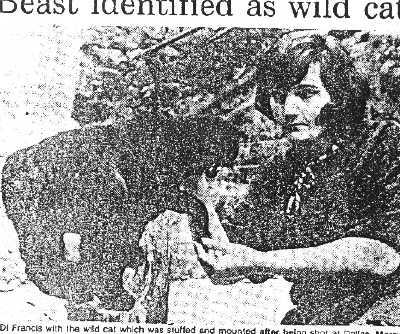 The natural history museum in London yesterday verified that the carcass of a black beast which she took to them after it was shot killing sheep in the Highlands of Scotland is a totally new strain of Scottish wild cat. It is taller and bigger than average and not the normal tabby colour. According to Miss Francis, 41, the beast is not the same as those which have been killing sheep on dartmoor and Exmoor and have recently been discovered in the Fraddon area of Cornwall. "I hope this will silence the sceptics who have always said that a new species could not exist in the South-West without anyone knowing. Mis Francis, of Brunswick Terrace, Torquay, has written two books on big cats in Britain and is now regarded as an expert. She said: "People don't realise there are big wild cats in all remote parts of Britain." The cat is one of three which have been shot in the same region of Morayshire in the last two years. "There have also been several visual sightings," said Miss Francis.